Would You Like To Be The Very Best Batter On Your Team? It's simple to become a great hitter, all you need to do is hit 100 balls a day. This specific swinging repetition develops a keen eye,muscle memory,and a power swing. These are the skills you need to be the best batter you can be. 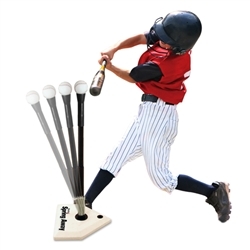 Among the best methods to develop into a great hitter is by using a batting tee. But existing batting tees tip over,jolt your bat,and wreck your swing, making you wish you'd never experimented with utilizing a batting tee to begin with. But, those days are gone forever! Introducing Spring Away! The ground breaking NEW batting tee that will not tip over, won't shock your bat, and won't ruin your swing, so that you can become a great batter in just 20 minutes a day. Simply place a baseball or softball on Spring Away's tee top, swing, tee another ball, and swing again! No more tipping over tees, no more bat shock, and no more ruining your swing! The secret is Spring Away's patented design, which springs forward every time you hit the ball, delivering durability & longer life. As a result becoming the most innovative batting tee anywhere! In contrast to other batting tees that have a lightweight platform, Spring Away has a weight fillable base so it will never tip over. Various other batting tees use a rigid tee stem, while Spring Away has a flexible tee stem that flexes away from your bat with each and every swing, eliminating bat shock, base rip out, and tearing of the tee top. But that's not all! Other batting tees have a single tee top. But Spring Away has a reversible tee top that tees regulation balls on one side and mini-balls on the other. These amazing mini-balls make it easy for you to develop a keen hitter's eye so you can get a hit every time you step up to bat. And Spring Away is so easy to use, it's great for boys, girls, moms and dads of all ages. in your garage, in the gym, and use Spring Away at the ball park before a big game. Use Spring Away any time! Spring Away is so portable, you can take it anywhere! And when you're through, simply store Spring Away in the garage, under your bed, or in your equipment bag!